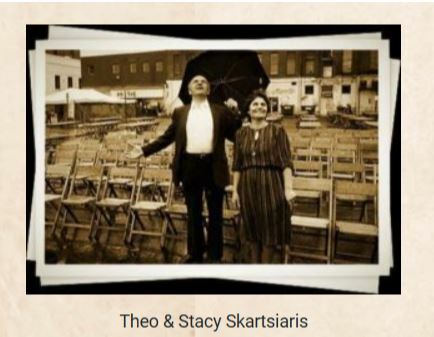 Theo & Stacy's Restaurant in downtown Kalamazoo is offering Civic patrons a truly Greek experience before performances on specific dates this season! Pastitsio - layers of macaroni, sauteed ground beef, topped with our bechamel sauce. Served with rice. Moussaka - layers of eggplant and sauteed ground beef, topped with our bechamel sauce. Served with rice. Grape Leaves - stuffed with ground beef and rice, topped with lemon dill flavored sauce. Greek Combo - our homemade Pastitsio, Moussaka and Grape Leaves. Served with rice. Authentic Greek Gyro - it's a combination of gently seasoned ground beef and lamb cooked slowly on a revolving spit to flavorful perfection. Moist and tender on the inside, crispy good on the outside. Served on a pita. Then for dessert - wrap of your Greek experience with Baklava or Homemade Rice Pudding or a Mini Chocolate Frog for kids! Dinner just $15 for Adults and $6 for Children. Order Dinner and your Civic ticket by clicking button below.